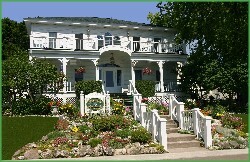 The Cloghaun B & B, a Mackinac Island B & B, is Michigan’s oldest family-owned B & B and is housed in one of the oldest Victorian homes on Mackinac Island. The family of the original founders, Thomas and Bridge Donnelly who completed the Cloghaun in 1884, have preserved the structure throughout the decades. Eleven guest rooms are decorated with antiques from the late 1800s. The Cloghaun is located one block from the Mackinac Island harbor and close to Mackinac Island restaurants and shopping.